We shot this look at sunset, and there happened to be a few rays of sunshine peeking through the trees behind me. It was quite the coincidence that I also chose to wear a pop of yellow. The sweetness of summer must be right around the corner. Today I'm styling this Hey Crystalie 3/4 sleeve top that features some geometric beading at the neckline. The best thing about this top is its versatility. The embellishments replace the need for statement jewelry, and the minimalistic silhouette makes it appropriate for any situation. 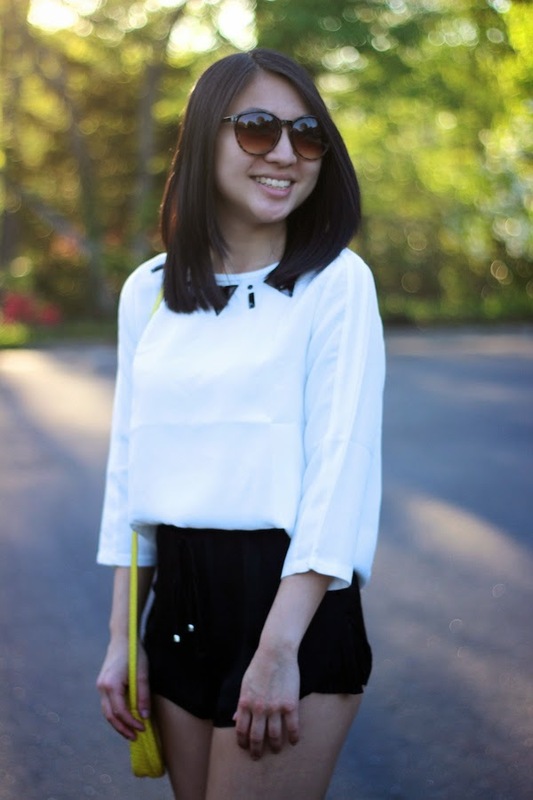 While I styled the top for a casual summer day, it can be taken into the workplace as well. As I mentioned in my last Hey Crystalie post, they offer high quality garments for great prices. The material of this top is thick enough that I don't even have to worry about my undergarments showing, and it's white! I decided to add a pop of yellow to the outfit with this adorable crossbody from Mango. It is the perfect little accessory to take when you don't want your hands full. I'll admit I haven't been gravitating towards typical summer colors, but I just can't help myself when it comes to monochrome. I'll do my best to add some color to the next post, but I make no promises... Talk to you soon! Oh i love the pop of yellow bag,you style this outfit well. Gorgeous, Christina! I love the pop of yellow from your outfit! It's so pretty especially with the sunlight!